Hello lovely ones. How’s things? Thankfully life settled down for us this past week. Our dear young people have gone home and with two of our girls away at camp, we downsized for a few days, enjoying a well earned rest. Not for long though, as I am hosting a tea party for 34 ladies next weekend in a local country hall. It will be a delightfully vintage affair and I can’t wait to show you a few pieces I have been working on, particularly a hand sewn backdrop made from embroidered linen, vintage tablecloths and doilies. 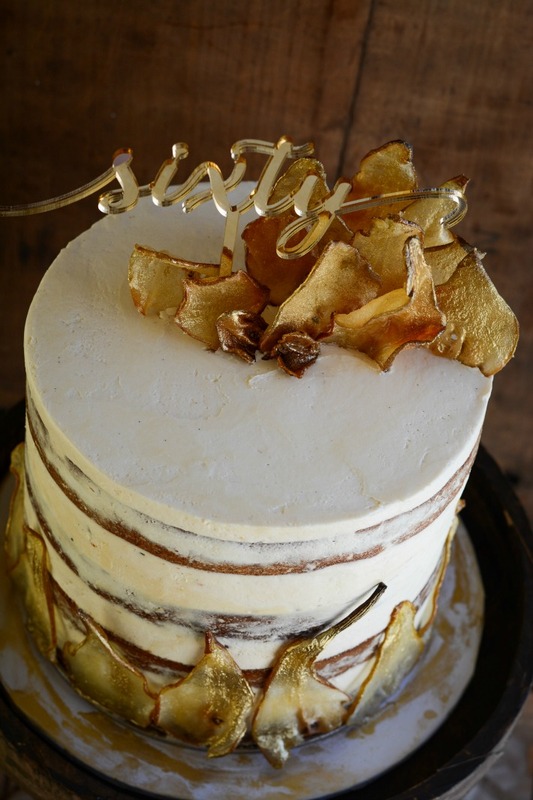 For now though, I want to show you this naked cake I made and embellished with candied pear slices. I was surprised by how simple they were to make and pretty delighted with the finished product. It was the first time I made them and I’m keen to experiment further with different fruits and vegetables. I tried our home grown baby beetroots, but they didn’t turn out so well. I’m thinking citrus – oranges, lemons and limes could work, and different types of apples. I’ll keep you posted on my progress. 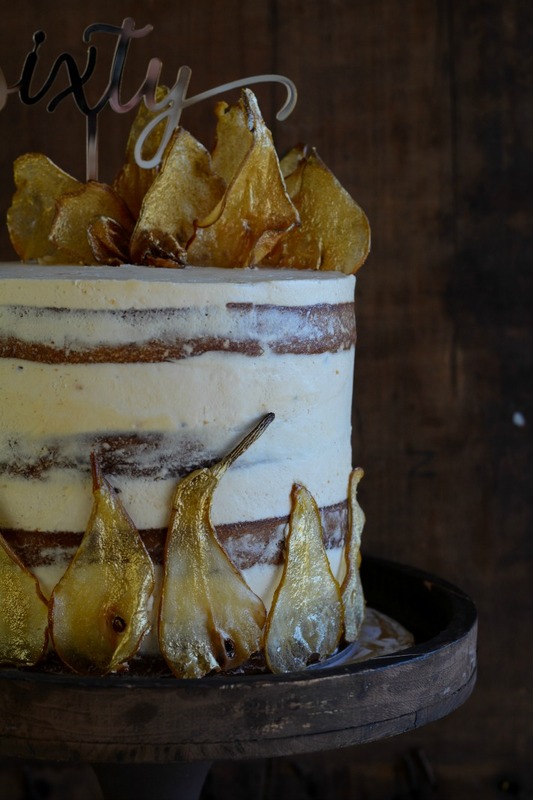 What really makes these candied pears pop is the edible gold dust brushed onto them, giving a real sparkle. You can buy it online at any cake decorating store. For ease, I lightly dusted the pear slices after I put them on the cake. This is such an easy way to dress up any simple cake or even cupcake. 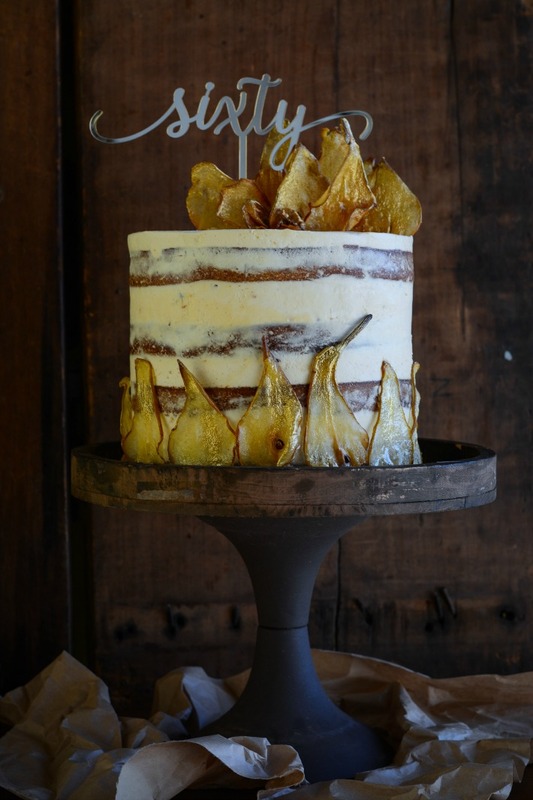 For this naked cake I gently pushed each slice of pear onto the side where the icing adhered them together. With the crisper pieces I carefully eased them onto the top of the cake. Nothing could be easier. 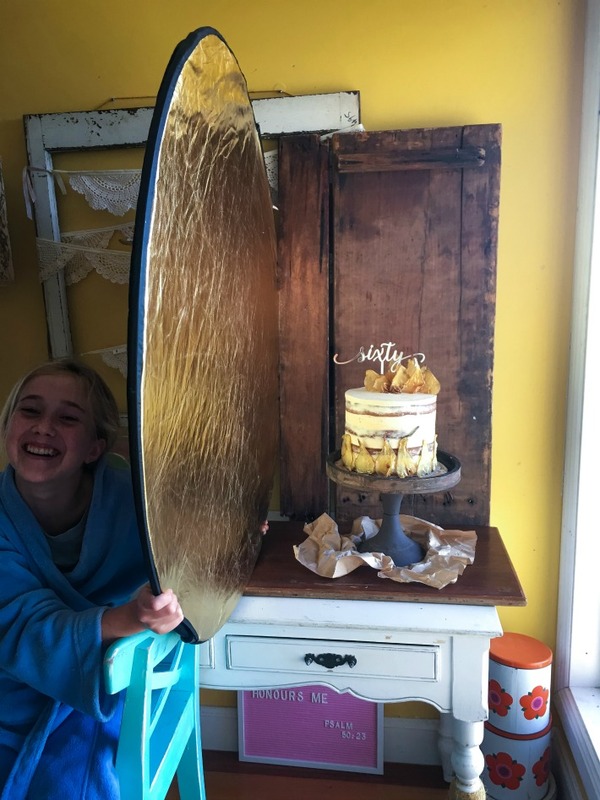 Just add a gold topper and you have yourself a fancy pants celebration cake. 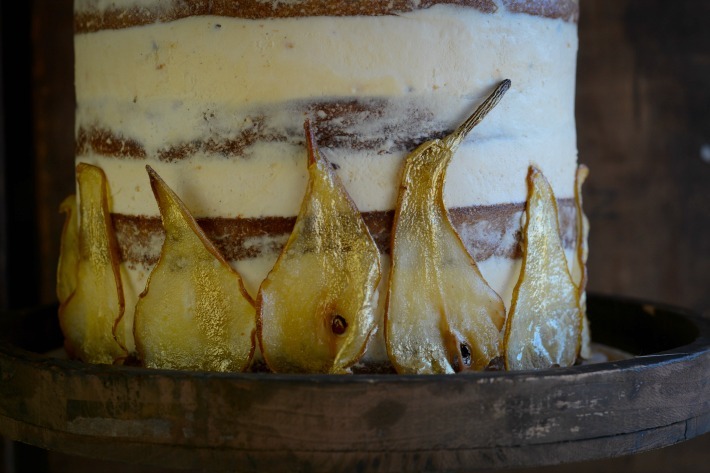 If you are interested in making candied pears, use the simple recipe below. A simple garnish to make for your next dessert, pudding or cake. 2 medium pears. Look for ones with a distinct bell shape. Edible gold dust, if using. Using a very sharp knife, carefully slice the pears as thin as you can from top to bottom. Leave the stalk on if you can. Put castor sugar on a side plate and coat both sides of each pear slice generously with sugar. Place pear slices on a lined baking tray and bake in slow oven (130C) for about twenty minutes. Check and turn over before continuing to bake for another ten or so minutes. Keep an eye on them and remove smaller slices before they get too brown. You will need to eye ball them to determine when they are ready. The edges will curl slightly and the pear will be translucent. When ready, take trays out of oven and leave to cool. When cool, slices should be crisp. Some may not, but you can still use the softer ones on the sides of your cake. 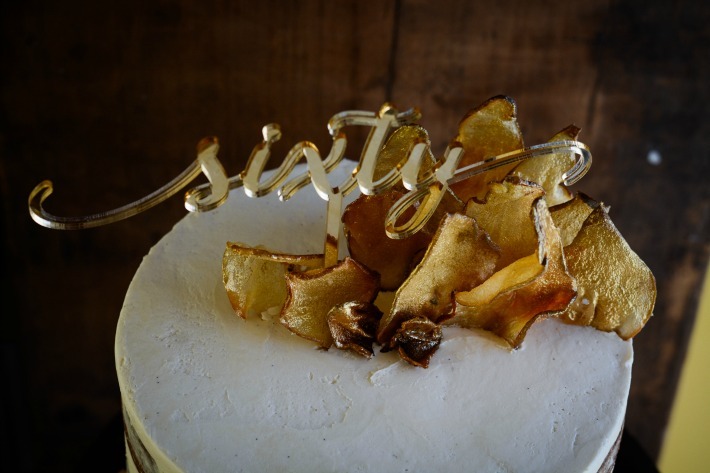 Use the crisp ones to decorate the top of the cake. 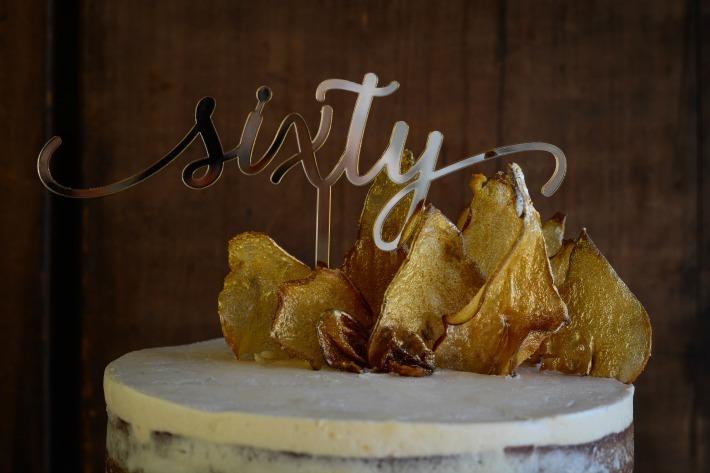 If you wish, dust each pear slice with edible gold dust for added glamour. I have a few fun cakes and projects to share with you in coming weeks, including a sweet ‘Brambly Hedge’ wedding I was involved in last weekend, more cakes, a delicious lemon blueberry cupcake recipe and a cute vintage cactus party I have been dying to show you. Thanks for popping into my happy place. Why don’t you drop me line, introduce yourself and say G’day. I’d love to hear from you. The last photo is my favourite, love the behind the scenes fun you must have with the girls helping out!